Summer is the perfect time for currently enrolled Toddlers to maintain the continuity developed throughout the school year, and for newly enrolled Toddlers to begin adjusting to the experience of a Montessori program among seasoned peers. Both sessions are based on summer themes including arts and crafts, nature walks, gardening, baking and much more! Priority goes to Jarrow Toddler students (enrolled in 18-19 or 19-20 school year). Unenrolled students will be placed on a wait list until March 1. 1/2 Day Session Registration * Hours: 8:30am – 12pm Monday – Friday (Pick-up 11:45pm-12pm) Pickup prior to lunch. Contact Courtney at courtney.laurell@jarrow.org to register. 1/2 Day Toddler Sessions I and II: Cost = $1,710. Jarrow’s Primary Summer Camp encompasses all the benefits of the traditional Montessori classroom with the added fun and adventure found on our extensive outdoor campus! 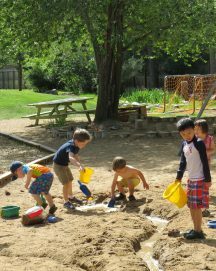 Campers engage in indoor and outdoor Montessori activities and lessons, as well as caring for and harvesting from our abundant school garden, free play and exploration on our many playgrounds, and our camper favorite, Friday Splash Day, which includes a blow-up water slide and other water play! Open to ALL children ages 3-6 (Jarrow enrollment not required!) Priority given to Jarrow families through Feb. 14. Contact courtney.laurell@jarrow.org to discuss full day registration. ATTENDANCE AND CANCELLATION POLICY: For program and curricular continuity, please note that your child’s attendance is expected for all 3 weeks of each session, and fees will not be prorated for any partial attendance. Fees will be refunded for any full session cancellations received in writing by the following cancellation dates: May 3, 2019 for Session I and May 30 for Session II. No refunds will be provided for session cancellations after the respective session cancellation dates. Space is limited and early registration is encouraged. Primary Camp Sessions are open exclusively to Jarrow families until Feb. 14, 2019. After that date, enrollment will be open to the public. Priority is given to currently enrolled Toddler families until March 1st. All other Toddlers will be placed on a waiting list. Jarrow’s 21st Gala is THIS Saturday! Click here for more info and ticket purchases! Jarrow Montessori has a few remaining openings for 3 to 7 year-olds the 2019-2020 school year. Toddler & Primary Summer Camp is Open for Registration! 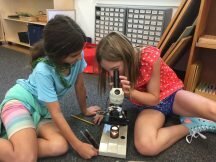 Elementary Summer Camp is Open for Registration! Thank you for your interest in Jarrow Montessori. Please Click Here to fill out an inquiry form. The inquiry will be sent to the Admissions office. We will get back to you within 2 business days of receiving your request.